Introducing the all-new EF4500iSE inverter from Yamaha. This mid-size portable generator falls into our line-up just after our very successful EF3000iSEB and comes packed with even more power and fuel efficiency in a quiet, portable package. The EF4500iSE was designed for maximum fuel efficiency and minimum noise, qualities which make it the ultimate RV accessory. Housing the most powerful engine in its class allows our biggest inverter to run at the very low engine speed of just 2600 rpm - 1000 rpm lower than other generators in its class. The slow engine speed translates into reduced fuel consumption as well as less noise, vibration and engine wear. 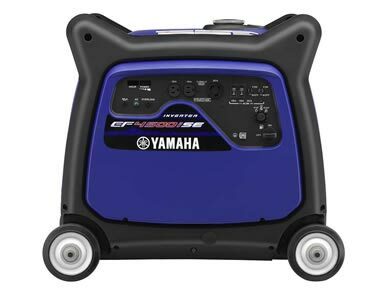 Of course features such as Yamaha's infamous reliability, durability and four-stroke fuel efficiency come standard. Setting Time Less than 2 sec. * Refer to Total Ampere specification for maximum available output. ** 2-year warranty on gas-powered generators, for non-commercial use only. See dealer for commercial warranty coverage. Alternate fuel generators and water pump receive one-year warranty (non-commercial use). See dealer for details.